When a recipe calls for kosher salt, here is the brand I use. If you use a different brand, the weight will differ slightly and proportions will have to be modified. Of course, you can modify according to your own taste. I prefer using kosher salt in most recipes because I find it easier to manipulate and dose. You will find this brand in most good stores. In Ottawa, I buy mine at Grace in the Kitchen, in Kanata. Fleur de sel is a finishing salt. You add it to cooked meat, salads, or other fine foods to brighten the flavour. The French are grand amateurs of fleur de sel, and with good reason. They collect it off the coasts of Brittany. Fleur de sel, or the English translation, ”flower of salt”, is a coarse salt which is rich in minerals and slightly moist. It is just a beautiful product, and perfect when used in moderation. Diets rich in salt increase the risk of hypertension and cardiovascular diseases, so moderation is always recommended. Favuzzi makes this wonderful Hot Chili Spread, ideal to add a bit of heat to soups, stews, pasta, pizza, and more. What is very interesting about this product is that the flavour is not unidimensional. 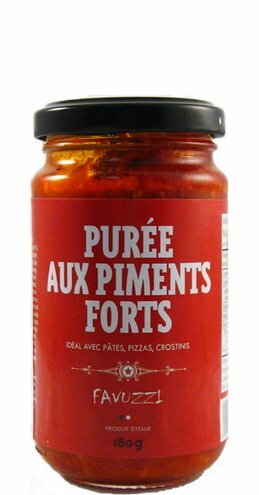 Although the paste contains 81% hot chili peppers, it also contains eggplant, zucchini, green olives, onions and garlic with just a hint of wine vinegar. Seriously addictive. Beware. Available in specialty stores. Check the Favuzzi store for a location near you. We had guests over last night for dinner, and it was a rainy summer evening, I thought a good comforting meal like lasagna bolognese would hit the spot, and it did. Everyone complimented me on my lasagna, said it was the best they had ever eaten. Of course, the bolognese sauce is in it for something, but these pasta noodles were also quite exceptional. I have been using these for a long time now, and I hope I will never have to use anything else again. These oven-ready lasagna sheets are in a class apart, mostly because they are so thin, their texture, once cooked, is exquisite, making for a very refined dish in the end, and nobody will know that you did not spend all day slaving in the kitchen making pasta from scratch. The job is excellently done for you. You can find them in good Italian markets, and at most Loblaws locations.